PRODUCT: Everhard MR08580 Rounded Edge Steel Detail Roller, 1/4 inch wide x 2 inch diameter, Fully Rounded Edge, 5-inch hardwood handle (7-1/2 in. Overall length), ball-bearing, professional grade. Price/Each. 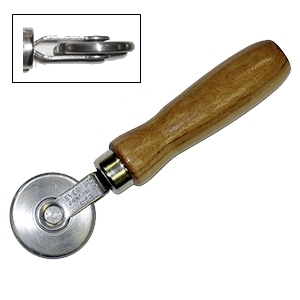 1/4" wide, fully-rounded, detail roller. All steel construction (except hard-wood handle). This roller makes work high quality work easy and faster.